I'm really excited to share this post with you all! 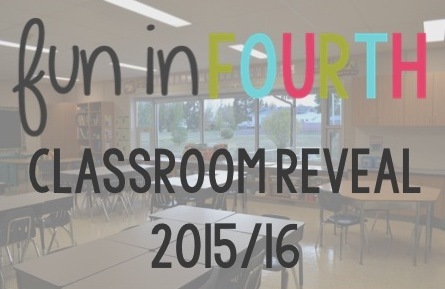 I've been working the past few weeks to get things ready so I could show you my classroom! With the strike last year, I didn't really have the opportunity to do a proper class reveal. We just got in and got rollin' last year! It was very enjoyable to have a few weeks to go in here and there and just putter. Much more relaxing. I kept some things the same from last year (my owl theme, blue bins), and changed some others (added a rug, a proper technology station). I'm very happy with it all and can't wait for my kiddos to come so we can share the space together. The view from my doorway. I am so blessed to have these gorgeous large windows. Often, I won't have the overhead lights on; we'll just use the natural light. 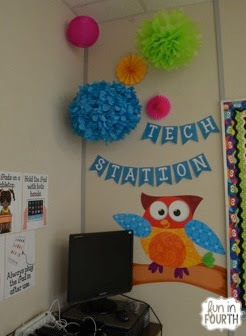 The front of my classroom and far wall. 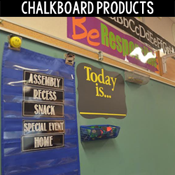 The first bulletin board will be used to house anchor charts. I haven't put any up yet because I like to teach to them first. That board will slowly become full over the first few weeks. 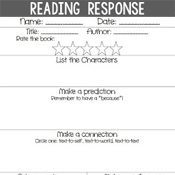 Some things I put on it are my SMARTLearning posters, Whole Brain stuff, Zones of Regulation and growth mindset info. The second board is reserved for student work. A close up of my alphabet this year. I used Little Lovely Leaders Math Alphabet. I love the rainbow colours and the literacy/math integration! I'm hoping it will serve as a bit of a math anchor chart as it has some great fractions, greater than less than, and shape references. Below my math alphabet is part of my SMARTLearning jumbo goals strip. Thanks Kim F. for blowing it up big for me! 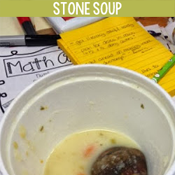 We use it to teach goal setting and use large magnets to mark off goals. Students have the small version at their desks. Moving around the corner.... Not the most beautiful desk for my Tech Station. I picked it because it is quite tall, and I'm hoping it can double as a standing work space. The desktop computer is a thorn in my side, but it is mandatory we keep them in our rooms. I hate all the wires below, but have decided that is a man job and I'm going to make Ryan come in and tack them all up. Beside the desktop is a dish rack containing my class iPads. I am so very lucky to have them!! We've done some amazing things with them, and I'm really pumped for a few new ideas for this year. I created some iPad rules which are hanging on the wall above. Let's not forget about my new rug! I know, I know, it's really light in colour. I Scotch Gard-ed the heck outta that thing, so hopefully it stays pretty. If not, oh well. We live here. I snagged the reading pillows at Wal-Mart for $15 a piece. You can see my Ketchup and Pickles pieces ready to go on the whiteboard too. Close up! Love my owl buddy from Trend. A favourite part of my room. All the poms are from a new local party store, who even gives a teacher discount. How awesome is that?! My genre posters are from Ginger Snaps. I teach to them as my class library is mainly organized by genre/series. 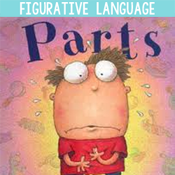 These posters are referred to by kiddos all year long. Continuing on.... my area. Ryan bought me my tiny teal desk off a local Buy and Sell page. I love it! I hated how big and clunky the traditional teacher desk was, but still needed somewhere to store my pens, stapler and daybook. This desk does that job quite nicely. I'm hoping to get some Wobble Seats for around my rainbow table (I think my American friends call it a kidney table??). It's hard to fit 6 kids around that thing when their chair legs are all smashing into each other. I'm really fortunate to have so many cupboards and shelves for storage. I use a few of them for a bit of decorating. Hello Kitty watches over me (I collect them, and this one was a gift from a student, most are in my scrapbook room at home). The Roll-a-Pencil was salvaged from a past principal. He was going to throw it away! A few rubons and painted wooden knobs and it was good to go. Fidgets, Brain Break sticks and some books are on another shelf. I have this shelving running all along under my window. It is super storage! The top shelf holds my class library, and the bottom holds all my tubs for duotangs and things. The tub labels are cut with vinyl on my Cricut. I have a book buying problem. I have way too many. My classroom library rotates often, I can't keep it all out at once. I do have some picture books, but mostly novels. I set this rack up with school library books, most with a social responsibility theme, but some favourites are mixed in there too! Math manipulatives and Lego. I love my new labels I made! Recycling station. The labels are for sale in my TpT shop. I've a huge paper bin on the floor too. My Positive Notes board. I made the title on my laptop, printed and cut out. I've blogged about this before. You can find the post here. 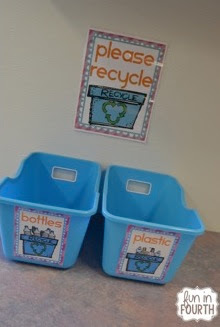 We use community supply bins in my classroom. These are from Really Good Stuff. I find it cuts down on mess in desks, pants being cut while I am teaching and pencil crayons rolling about the floor. The Parent Handbook is from Amber Reed and I'm really excited to use it this year! I'm hoping the interactive element makes it more engaging. I cut this quote out of vinyl on my Cricut. We aren't really supposed to have things on the door. Rules are made to be broken, right? My hallway bulletin board this year! Ryan made me the handle out of cardboard. The "bristles" are my trusty friend the Dollar Store plastic table cloth. I saw many variations of this board on Pinterest. 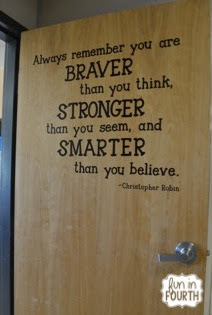 I chose the saying because it projected a growth mindset, something I'm really big on. 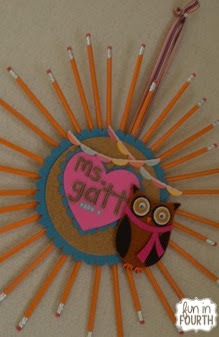 Are you interested in even more bulletin board ideas? Do you want to save time by finding them all in one place? 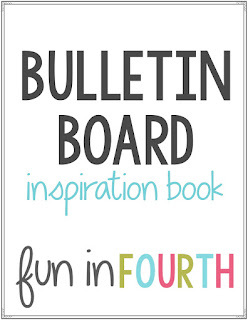 Follow the image or button below to grab your copy of my free bulletin board inspiration guide. Amazing classroom! Love the recycling bins and your awesome quote on the door!! And that bulletin board. LOVE!!! Wow Angela!! I am impressed!